For many Christians and Muslims, the miracles are actual historical events. Others, including many liberal Christians, consider these stories to be figurative. [a] Since the Enlightenment, scholars have taken a highly skeptical approach to claims about miracles. In most cases, Christian authors associate each miracle with specific teachings that reflect the message of Jesus. In The Miracles of Jesus, H. Van der Loos describes two main categories of miracles attributed to Jesus: those that affected people, e.g., the Blind Man of Bethsaida and are called "healings", and those that "controlled nature", e.g., Walking on Water. The three types of healings are cures where an ailment is cured, exorcisms where demons are cast away and the resurrection of the dead. Karl Barth said that, among these miracles, the Transfiguration of Jesus is unique in that the miracle happens to Jesus himself. According to Craig Blomberg, one characteristic shared among all miracles of Jesus in the Gospel accounts is that he delivered benefits freely and never requested or accepted any form of payment for his healing miracles, unlike some high priests of his time who charged those who were healed. In Matthew 10:8 he advised his disciples to heal the sick without payment and stated: "freely ye received, freely give." It is not always clear when two reported miracles refer to the same event. For example, in the Healing the Centurion's servant, the Gospels of Matthew[8:5-13] and Luke[7:1-10] narrate how Jesus healed the servant of a Roman Centurion in Capernaum at a distance. The Gospel of John[4:46-54] has a similar but slightly different account at Capernaum, and states that it was the son of a royal official who was cured at a distance. The largest group of miracles mentioned in the New Testament involves cures. The Gospels give varying amounts of detail for each episode, sometimes Jesus cures simply by saying a few words, at other times, he employs material such as spit and mud. Generally they are referred to in the Synoptic Gospels but not in the Gospel of John. The canonical Gospels tell a number of stories of Jesus healing blind people. The earliest is a story of the healing of a blind man in Bethsaida in the Gospel of Mark. Mark's Gospel also has an account of the healing of a man named Bartimaeus, done as Jesus is leaving Jericho. The Gospel of Matthew  has a simpler account loosely based on this, with two unnamed blind men instead of one (this 'doubling' is a characteristic of Matthew's treatment of the Mark text) and a slightly different version of the story, taking place in Galilee, earlier in the narrative. The Gospel of Luke tells the same story of Jesus healing an unnamed blind man, but moves the event in the narrative to when Jesus approaches Jericho. A story in which Jesus cures a leper appears in Mark 1:40-45, Matthew 8:1-4 and Luke 5:12-16. Having cured the man, he instructs him to offer the requisite ritual sacrifices as prescribed by the Deuteronomic Code and Priestly Code, and not to tell anyone who had healed him; but the man disobeyed, increasing Jesus' fame, and thereafter Jesus withdrew to deserted places, but was followed there. In an episode in the Gospel of Luke Luke 17:11-19, while on his way to Jerusalem, Jesus sends ten lepers who sought his assistance to the priests, and they were healed as they go, but the only one who comes back to thank Jesus is a Samaritan. Healing the paralytic at Capernaum appears in Matthew 9:1-8, Mark 2:1-12 and Luke 5:17-26. The Synoptics state that a paralytic was brought to Jesus on a mat; Jesus told him to get up and walk, and the man did so. Jesus also told the man that his sins were forgiven, which irritated the Pharisees. Jesus is described as responding to the anger by asking whether it is easier to say that someone's sins are forgiven, or to tell the man to get up and walk. Mark and Luke state that Jesus was in a house at the time, and that the man had to be lowered through the roof by his friends due to the crowds blocking the door. The Cure of a bleeding woman miracle appears in Mark 5:21-43, Matthew 9:18-26 and Luke 8:40-56, along with the miracle of the Daughter of Jairus. The Gospels state that while heading to Jairus' house Jesus was approached by a woman who had been bleeding for 12 years, and that she touched Jesus' cloak (fringes of his garment) and was instantly healed. Jesus turned about and, when the woman came forward, said "Daughter, your faith has healed you, go in peace". Healing the mother of Peter's wife. The Synoptics describe Jesus as healing the mother-in-law of Simon Peter when he visited Simon's house in Capernaum, around the time of Jesus recruiting Simon as an Apostle (Mark has it just after the calling of Simon, while Luke has it just before). The Synoptics imply that this led other people to seek out Jesus. Jesus healing an infirm woman appears in Luke 13:10-17. While teaching in a synagogue on a Sabbath, Jesus cured a woman who had been crippled by a spirit for eighteen years and could not stand straight at all. Healing a man with dropsy is described in Luke 14:1-6. In this miracle, Jesus cured a man with dropsy at the house of a prominent Pharisee on the Sabbath. Jesus justified the cure by asking: "If one of you has a child or an ox that falls into a well on the Sabbath day, will you not immediately pull it out?" In the Healing of the man with a withered hand miracle, the Synoptics state that Jesus entered a synagogue on Sabbath, and found a man with a withered hand there, whom Jesus healed, having first challenged the people present to decide what was lawful for Sabbath—to do good or to do evil, to save life or to kill. The Gospel of Mark adds that this angered the Pharisees so much that they started to contemplate killing Jesus. The Healing the deaf mute of Decapolis miracle only appears in the Gospel of Mark. [7:31-37] The Gospel states that Jesus went to the Decapolis and met a man there who was deaf and mute, and cured him. Specifically, Jesus first touched the man's ears, and touched his tongue after spitting, and then said Ephphatha!, an Aramaic word meaning Be opened. The Healing of Malchus was Christ's final miracle before his resurrection. Simon Peter had cut off the ear of the High Priest's servant, Malchus, during the scene in the Garden of Gethsemane. Jesus restored the ear by touching it with his hand. The Healing the Centurion's servant miracle is reported in Matthew 8:5-13 and Luke 7:1-10. These two Gospels narrate how Jesus healed the servant of a Roman Centurion in Capernaum. John 4:46-54 has a similar account at Capernaum, but states that it was the son of a royal official who was cured at a distance. Jesus healing in the land of Gennesaret appears in Matthew 14:34-36 and Mark 6:53-56. As Jesus passes through Gennesaret all those who touch his cloak are healed. Matthew 9:35-36 also reports that after the miracle of Jesus exorcising a mute, Jesus went through all the towns and villages, teaching in their synagogues, proclaiming the good news of the kingdom and healing every disease and sickness. According to the three Synoptic Gospels, Jesus performed many exorcisms of demoniacs. These incidents are not mentioned in the Gospel of John and appear to have been excluded due to theological considerations. Exorcism at the Synagogue in Capernaum, where Jesus exorcises an evil spirit who cries out, "What do you want with us, Jesus of Nazareth? Have you come to destroy us? I know who you are—the Holy One of God!". Exorcism of the Gerasene demoniac or "Miracle of the (Gadarene) Swine": Jesus exorcises a possessed man (changed in the Gospel of Matthew to two men). When Jesus asks the demon's name (finding the name of the possessing demon was an important traditional tool of exorcists), he is given the reply Legion, "...for we are many". When the demons asked to be expelled into a nearby group of pigs rather than be sent out of the area, Jesus obliges, but the pigs then run into the lake and are drowned. Exorcism of the Syrophoenician woman's daughter, appears in Matthew 15:21-28 and Mark 7:24-30. A Gentile woman asks Jesus to heal her daughter, but Jesus refuses, saying that he has been sent only to "the lost sheep of the house of Israel". The woman persists, saying that "dogs eat of the crumbs which fall from their masters' table". In response Jesus relents and informs her that her daughter has been healed. Exorcising the blind and mute man, appears in Matthew 12:22-32, Mark 3:20-30, and Luke 11:14-23. Jesus heals a demon-possessed man who was blind and mute. People are astonished and ask, "Could this be the Son of David?" Exorcising a boy possessed by a demon, appears in Matthew 17:14-21, Mark 9:14-29, and Luke 9:37-49. A boy possessed by a demon is brought forward to Jesus. The boy is said to have foamed at the mouth, gnashed his teeth, become rigid and involuntarily fallen into both water and fire. Jesus' followers could not expel the demon, and Jesus condemns the people as unbelieving, but when the father of the boy questions if Jesus could heal the boy, he replies "everything is possible for those that believe". The father then says that he believes and the child is healed. The miracle of Jesus exorcising at sunset appears in the Synoptic Gospels just after healing the mother of Peter's wife, in Matthew 8:16-17, Mark 1:32-34 and Luke 4:40-41. In this miracle Jesus heals people and cast out demons. The miracle of Jesus exorcising a mute appears in Matthew 9:32-34 immediately following the account of the miracle of Jesus healing two blind men. A man who is demon-possessed and could not talk is brought to Jesus, who exorcises the demon, and the man is able to speak. Daughter of Jairus. [Mk 5:21-43] Jairus, a major patron of a synagogue, asks Jesus to heal his daughter, but while Jesus is on the way, Jairus is told his daughter has died. Jesus tells him she was only sleeping, and wakes her with the words Talitha kum! The Young Man from Nain. [Lk 7:11-17] A young man, the son of a widow, is brought out for burial in Nain. Jesus sees her, and his pity causes him to tell her not to cry. Jesus approaches the coffin and tells the man inside to get up, and he does so. The Raising of Lazarus. [Jn 11:1-44] A close friend of Jesus who had been dead for four days is brought back to life when Jesus commands him to get up. Turning water into wine at a wedding, when the host runs out of wine, the host's servants fill vessels with water at Jesus' command, then a sample is drawn out and taken to the master of the banquet who pronounces the content of the vessels as the best wine of the banquet. Feeding the multitude—Jesus, praying to God and using only a few loaves of bread and several fish, feeds thousands of men, along with an unspecified number of women and children; there are even a number of baskets of leftovers afterward. Transfiguration of Jesus—Jesus climbed a mountain and was changed so that his face glowed, and the prophets Moses and Elijah appeared next to him. Calming the storm–during a storm, the disciples woke Jesus, and he rebuked the storm causing it to become calm. Jesus then rebukes the disciples for lack of faith. Finding a coin in the fish's mouth is reported in Matthew 17:24-27. Cursing the fig tree–Jesus cursed a fig tree, and it withered. A miracle similar to the miraculous catch of fish, also called the catch of 153 fish to distinguish it from the account in Luke, is reported in the Gospel of John but takes place after the Resurrection of Jesus. Accounts of Jesus performing miracles are also found outside the New Testament. Later, 2nd century texts, called Infancy Gospels, narrate Jesus performing miracles during his childhood. Miracles performed by Jesus are mentioned in two sections of the Quran (suras 3:49 and 5:110) in broad strokes with little detail or comment. Miracles were widely believed in around the time of Jesus. Gods and demigods such as Heracles (better known by his Roman name, Hercules), Asclepius (a Greek physician who became a god) and Isis of Egypt all were thought to have healed the sick and overcome death (i.e. have raised people from the dead). Some thought that mortal men, if sufficiently famous and virtuous, could do likewise; there were myths about philosophers like Pythagoras and Empedocles calming storms at sea, chasing away pestilences, and being greeted as gods, and similarly some Jews believed that Elisha the Prophet had cured lepers and restored the dead. The achievements of the 1st century Apollonius of Tyana, though occurring after Jesus' life, were used by a 3rd-century opponent of the Christians to argue that Christ was neither original nor divine (Eusebius of Caesaria argued against the charge). The first Gospels were written against this background of Hellenistic and Jewish belief in miracles and other wondrous acts as signs - the term is explicitly used in the Gospel of John to describe Jesus' miracles - seen to be validating the credentials of divine wise men. Many Christians believe Jesus' miracles were historical events and that his miraculous works were an important part of his life, attesting to his divinity and the Hypostatic union, i.e., the dual natures of Jesus as God and Man. They see Jesus' experiences of hunger, weariness, and death as evidences of his humanity, and miracles as evidences of his divinity. Christian authors also view the miracles of Jesus not merely as acts of power and omnipotence, but as works of love and mercy, performed not with a view to awe by omnipotence, but to show compassion for sinful and suffering humanity. And each miracle involves specific teachings. "Do not believe me unless I do what my Father does. But if I do it, even though you do not believe me, believe the miracles, that you may know and understand that the Father is in me, and I in the Father." "Rise and go; your faith has saved you." 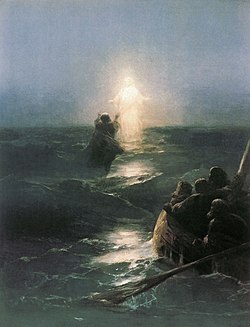 Christian authors have discussed the miracles of Jesus at length and assigned specific motives to each miracle, e.g., authors Pentecost and Danilson suggest that the Walking on Water miracle centered on the relationship of Jesus with his apostles, rather than their peril or the miracle itself. And that the miracle was specifically designed by Jesus to teach the apostles that when encountering obstacles, they need to rely on their faith in Christ, first and foremost. Authors Donahue and Harrington argue that the Daughter of Jairus miracle teaches that faith as embodied in the bleeding woman can exist in seemingly hopeless situations, and that through belief, healing can be achieved, in that when the woman is healed, Jesus tells her "Your faith has healed you". Liberal Christians place less emphasis on miraculous events associated with the life of Jesus than on his teachings. The effort to remove superstitious elements from Christian faith dates to intellectual reformist Christians such as Erasmus and the Deists in the 15th–17th centuries. In the 19th century, self-identified liberal Christians sought to elevate Jesus' humane teachings as a standard for a world civilization freed from cultic traditions and traces of pagan belief in the supernatural. The debate over whether a belief in miracles was mere superstition or essential to accepting the divinity of Christ constituted a crisis within the 19th-century church, for which theological compromises were sought. Attempts to account for miracles through scientific or rational explanation were mocked even at the turn of the 19th–20th century. A belief in the authenticity of miracles was one of five tests established in 1910 by the Presbyterian Church in the United States of America to distinguish true believers from what they saw as false professors of faith such as "educated, 'liberal' Christians." Contemporary liberal Christians may prefer to read Jesus' miracles as metaphorical narratives for understanding the power of God. Not all theologians with liberal inclinations reject the possibility of miracles, but may reject the polemicism that denial or affirmation entails. "As the violations of truth are more common in the testimony concerning religious miracles, than in that concerning any other matter of fact; this must diminish very much the authority of the former testimony, and make us form a general resolution, never to lend any attention to it, with whatever specious pretence it may be covered." Bart Ehrman states that what makes science possible is the assumption of the uniformity of the laws of nature, but given that miracles are by definition events that go against the usual way nature works, historians are virtually unable to confirm or refute reports of Jesus' miracles. According to the Jesus Seminar Jesus probably cured some sick people, but described Jesus' healings in modern terms, relating them to "psychosomatic maladies." They found six of the nineteen healings to be "probably reliable". Most participants in the Jesus Seminar believe Jesus practiced exorcisms, as Josephus, Philostratus, and others wrote about other contemporary exorcists, but do not believe the gospel accounts were accurate reports of specific events or that demons exist. They did not find any of the nature miracles to be historical events. ^ Baker Theological Dictionary of the Bible defines a miracle as "an event in the external world brought about by the immediate agency or the simple volition of God." It goes on to add that a miracle occurs to show that the power behind it is not limited to the laws of matter or mind as it interrupts fixed natural laws. So the term supernatural applies quite accurately. Elwell, Walter A., ed. (2001). Baker Theological Dictionary of the Bible. Baker Academic. ISBN 978-0801022562. ^ "Luke 18:35-43". Bible.oremus.org. 2011-02-10. Retrieved 2018-04-19. ^ Twelftree (1999), p. 283. ^ "Wendy Cotter, "Miracles in Greco-Roman antiquity: a sourcebook" (Routledge, 1999) pp.11-12, ff". Books.google.com. Retrieved 2018-04-19. ^ "Wendy Cotter, "Miracles in Greco-Roman antiquity: a sourcebook" (Routledge, 1999) pp.37-38". Books.google.com. Retrieved 2018-04-19. ^ "Wendy Cotter, "Miracles in Greco-Roman antiquity: a sourcebook" (Routledge, 1999) pp.50-53". Books.google.com. Retrieved 2018-04-19. ^ "Everett Ferguson, Michael P. McHugh, Frederick W. Norris, "Encyclopedia of early Christianity, Volume 1", p.804". Books.google.com. Retrieved 2018-04-19. ^ "Watson E. Mills, Roger Aubrey Bullard, "Mercer dictionary of the Bible" (Mercer University Press, 1991) p.61". Books.google.com. Retrieved 2018-04-19. ^ a b c "Catholic Encyclopedia on Miracles". Newadvent.org. 1911-10-01. Retrieved 2018-04-19. ^ F.J. Ryan, Protestant Miracles: High Orthodox and Evangelical Authority for the Belief in Divine Interposition in Human Affairs (Stockton, California, 1899), p. 78 online. Full text downloadable. ^ Dan P. McAdams, The Redemptive Self: Stories Americans Live By (Oxford University Press, 2006), p. 164 online. ^ "Modern History Sourcebook: David Hume: On Miracles". Fordham.edu. Retrieved 2018-04-19. ^ Ehrman, Bart D.. Jesus, Interrupted, HarperCollins, 2009. ISBN 0-06-117393-2 page 175: "We would call a miracle an event that violates the way nature always, or almost always, works ... By now I hope you can see the unavoidable problem historians have with miracles. Historians can establish only what probably happened in the past, but miracles, by their very nature, are always the least probable explanation for what happened"
^ Funk, Robert W. and the Jesus Seminar. The acts of Jesus: the search for the authentic deeds of Jesus. HarperSanFrancisco. 1998. p. 566. Twelftree, Graham H. (1999). Jesus the Miracle Worker: A Historical and Theological Study. IVP Academic. ISBN 978-0830815968.